David Clague is our guest on Planet Watch. 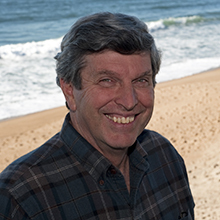 He is a senior scientist and volcanologist at MBARI, the Monterey Bay Aquarium Research Institute. He talks about how Kilauea and other large active volcanoes help us learn more about our planet. Dave’s research interests are nearly all related to the formation and degradation of oceanic volcanoes, particularly Hawaiian volcanoes, mid-ocean ridges, and isolated seamounts. Topics of interest include: compositions of mantle sources for basaltic magmas and conditions of melting; development and evolution of magma chambers beneath spreading centers and Hawaiian volcanoes; volatile and rare-gas components in basaltic magmas and their degassing history; chronostratigraphic studies of eruption sequence and evolution of lava chemistry during volcano growth; subsidence of ocean volcanoes and its related crustal flexure, plate deformation, and magmatic activity; formation of cumulate xenoliths during different stages of Hawaiian volcanism; transport of volcaniclastic sediment on submarine slopes of volcanoes; geologic setting of hydrothermal activity; origin of isolated seamounts; monitoring of magmatic, tectonic, and hydrothermal activity at submarine and subaerial volcanoes; emplacement dynamics of subaerial and submarine lava flows; slope instability on volcanoes. Other guests include Tim Goncharoff of Santa Cruz County Public Works Department, talking about the changes to recycling post China’s ruling on zero imported waste. Air Date: June 10, 2018on KSCO radio station AM1080.